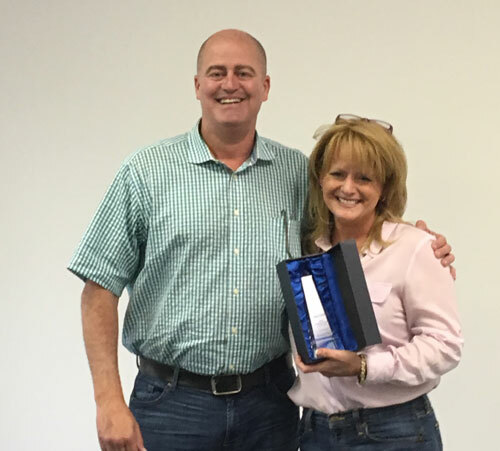 Elizabeth Rather of our Dallas, Texas office is the 2015-2016 Cisco-Eagle ESOP Employee-Owner of the Year, an annual award presented by our ESOP (employee ownership) Advisory Committee. (above: Elizabeth Rather and Cisco-Eagle president Darein Gandall). The award recognizes an employee-owner who has gone beyond what is expected to promote and support ownership culture. Cisco-Eagle believes that empowered, fully-invested employees who own a stake in their company is the best business approach. It allows us to provide exceptional customer service and engagement. This award is not selected by senior management — it is awarded directly by a committee of employees based on a nomination process that includes all employees. Elizabeth is a Website Sales Associate. In that role, she handles hundreds of calls, chats and inquiries every week from our website, www.cisco-eagle.com. When customers have completed post-order surveys, they have raved about her service. Whether she is helping a customer specify the right product, quoting prices, answering questions or helping when an issue emerges, Elizabeth personifies our belief that engaged employee-owners simply provide higher quality service and commitment to customer satisfaction. She has extensive knowledge of our product lines and how to apply them in ways that help customers get exactly what they need. “Elizabeth is always promoting our ESOP culture and never shies away from a task. She makes this company better each and every day,” said Taylor Banks, Cisco-Eagle’s Director of Strategic Sales. Elizabeth diligently attends our business huddles, and is a very active participant in various committees and process improvements within the company. If there is a Cisco-Eagle ESOP event, she has most likely been leading the parade behind the scenes in many areas of preparation for each event. Elizabeth does not shy away from running with good ideas to improve her surroundings. Her influence touches many lives and brightens many days for those who come in contact with her. Elizabeth strives to create a fun, positive, and enjoyable atmosphere. If something needs to be done, don’t tell Elizabeth unless you are ready for change! “Elizabeth is a committed employee owner, ready and able to jump in and help on any project at any time—she has a ‘get ‘er done’ attitude,” another employee noted. She not only takes time to be involved in these activities, but also has attended Southwest Chapter ESOP conferences in the desire to bring new ideas to our own ESOP Advisory Committee. She will represent Cisco-Eagle at the ESOP Association Conference in Washington, DC this May. Congratulations to Elizabeth for a job well done!